Most online shoppers can’t make a purchase without needing to contact customer support. More and more users are turning to Google with “how-to” search queries. Build trust by telling your customers the whole story—not just the part that benefits you financially. Small moments of personalization left a big impact on Dan during a recent trip to a car dealership. 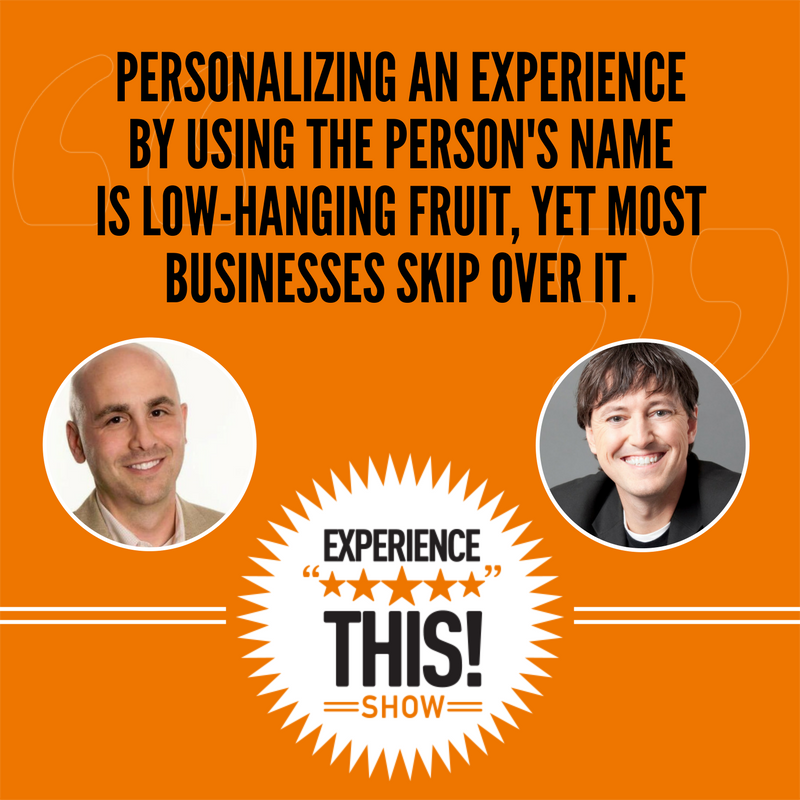 As Dan can attest, using someone’s name can personalize a customer experience in a meaningful way. Dan’s car dealership used both simple and sophisticated technologies to identify him and personalize his experience accordingly. Small, photo-worthy CX moments can have a strong impact on the word-of-mouth surrounding your business. Using a customer’s name is a simple, impactful way to personalize a customer experience. Joey’s recent routine oil change turned out to be a much pricier trip to the auto shop than he’d anticipated. However, what could have been a slimy up-sell remained a positive customer experience thanks to this business’s commitment to building trust with its customers. Being transparent with your customers—habitually, and not just when it serves you financially—plays a major role in building trust. Businesses must be as truthful with their less-knowledgeable customers as they are with their engaged, knowledgeable customers. “How-to” searches are on the rise, reinforcing that Google is one of the first places customers go to find answers to their questions. Creating high-value content to answer these questions and educate potential customers should be a top priority for your business. “How-to” searches have increased by more than 140 percent since 2004, according to new research from Google. How-to content helps your business stand out from the crowd when customers are on the hunt for answers. 83 percent of customers shopping online require some support or service to complete their purchase. That’s not good, given how many customers turn to online shopping for the convenience of a self-serve shopping experience. Most customers who are shopping online turn to customer support to complete their purchase. Companies like Amazon maintain top-notch customer experience by minimizing the need to contact customer support when making a purchase. Welcome to Experience This! 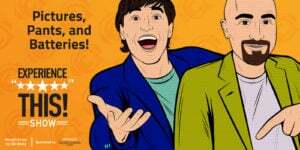 where you'll find inspiring examples of customer experience, great stories of customer service, and tips on how to make your customers love you even more. Always upbeat and definitely entertaining, customer attention expert Joey Coleman and social media expert Dan Gingiss serve as your hosts for a weekly dose of positive customer experience. Hold on to your headphones, it's time to Experience This! Joey: Join us as we discuss great experiences with car dealerships and brake repair shops, plus learning how to do just about anything. Dan: Oil changes, new brakes and Googling. Oh my! Joey: Sometimes a remarkable experience deserves deeper investigation. We dive into the nitty-gritty of customer interactions and dissect how and why they happen. Joins us while we're dissecting the experience. Dan: You know, Joey, when I had to take my car in for the first time to get a checkup, I had a really interesting experience that I didn't expect. I drove into the garage and you have to drive over this little sort of bump in order to get into the garage, and two things ended up happening, which I thought was really cool. The first was that they're actually reading the tires when you go over this bump and you instantly get a report as soon as you get out of the car that tells you your tire pressure and how they're aligned and all that sort of stuff. It gives you a picture of it, which is just a neat way of sharing that information. Joey: Wait, sorry to interrupt there, so they're figuring that out just based on you driving into the garage and driving over these little bumps? Dan: ... they don't have to check anything, it just reads it as you go over this bump. Joey: Wow, and then they feed that information back to you right away so that you've just had what would normally take a technician a while to check, at least 20 minutes, maybe more the way most technicians move, and it would be something that they can feed you that information instantly as you get to of the car. Dan: Except I didn't get out of the car immediately. Do you want to know why? Joey: You wanted to take a picture. Dan: ... take a picture of it. Joey: We have the same, what shall we say, affliction, or a curse, that when we see a cool customer experience happening, the first we thing we do is reach for our phones to be able to put that into a presentation or tell the story later. Dan: What I loved about this was I was thinking about how this dealership had to make some investment in this technology, right? There's some scanner that they bought and it feeds over into a screen, but the reality is it's a one-time investment and it affects every experience of every person driving in after that, and it affects it in a positive way. It feels nice to see your name up in lights on a screen. That's a pretty cool feeling and it's unique. It's something that you don't see when you walk into most stores or restaurants or wherever it is that you're walking into, and so it's also memorable. To me, the memorability part is one of the things that teaches you that you're onto an experience that's meaningful, is when people remember it and then are willing to talk about it. Obviously we're in a day and age where people share stuff on social media, and so if you can make it visual and you can make it worth taking a picture of, people will do that and they'll share it all over the place. Joey: So true. I think there's a couple of things. One, the simple act of personalizing an experience by using the person's name is such low-hanging fruit that most businesses just skip over. I mean, I don't know about you, any time I'm interacting with someone who is wearing their name, whether that's on a badge or it's sewn into the shirt they're wearing, I always use their name when I'm speaking to them, mainly because I feel like if you're going to have to wear an article of clothing at work that says your name, the least I can do is give you the courtesy of calling you by your own name. One of the interesting things about that is that they've done research, and do you know what the most pleasing sound of all the sounds in the world, the most pleasing sound to the human ear that lights up the most aspects of the brain when it hears it? Dan: I'm guessing it's not fingernails on a chalkboard. Joey: It's not fingernails on the chalkboard, and I kind of led the witness there a little bit. It's the sound of your own name, right? It's amazing to me how few companies use that. Now, what I love about your dealership story is they go the extra level by putting your name on the screen so that you can see it, and you're right, it becomes something that is remarkable. And the thing about the word “remarkable,” we hear it bandied about in the world of customer service and customer experience often, but what remarkable actually is defined as is “worthy of making a remark about, worthy of talking about,” and so many people are chasing word of mouth and they recognize the value that getting your customers to talk about you can have on your business, and yet they're missing this very basic opportunity to be remarkable. With most businesses, they know your name, right? And with a dealership, for example, you had an appointment for this checkup that you went in for, right? So they knew you were coming. Maybe a company might say, "Well, look, we can't invest in the technology to have license plate scanners," but I remember showing up for a client meeting one time and I walked into their lobby. In their lobby they had this giant screen that was rotating through pictures of their company in little scenes, and one of the slides said, "Welcome, Joey Coleman. We're excited to have you here today." I remember thinking this took very little time for someone to set up, but the level of welcome and comfort and warmth that I felt knowing, hey, they're actually excited to see me and I'm in the right place and I'm where I'm supposed to be and they know it and everybody in the lobby knows it, really made me feel special as a customer. Dan: Yeah, and I think that's the biggest takeaway is that this is not a real big thing; this is a little thing. Using somebody's name is a little thing, and it's not that hard to do. Every business can do it. I think the takeaway is that little things matter and they can make the experience remarkable. Announcer: We love telling stories and sharing key insights you can implement or avoid based on our experiences. Can you believe that this just happened? Joey: I had an experience the other day, Dan, that could've been a horrible experience, but it wasn't. I went in to get an oil change and while they were checking out my car ... I go to this great group of mechanics in Denver, JC's British, and while they were checking out my vehicle, they said, "Joey, we hate to tell you this but you need new brakes." Dan: Hey, can I ask you a quick question? Sorry to interrupt. Dan: Do you tend to go to companies that have the same initials as yours? Dan: Is that like a purpose sort of thing? Joey: Whenever possible. You know my brand loyalty is really strong. Actually, full disclosure, I own the company. No, I don't own the company, but I do know JC. No, not at all. But it's just a nice convenient coincidence, absolutely. Dan: Okay, I was just checking. Joey: No, that's good of you to check in. Dan: I get my brakes done at DGs, so that's why I was curious. Joey: So anyway, I go in and I'm thinking this is going to be a sub-$100 trip. I'm just getting an oil change, right? This is not going to be super expensive, go in, get the oil change and I'll hang out there while they do the oil change, which is what I always do 'cause the place I go to is probably close to an hour away from my house. But while I'm there I get told that this is not going to be a sub $100 experience, this is going to be a greater than $1,000 experience. Joey: So needless to say, a completely different customer experience than my expectation had been going into it, and I certainly wasn't excited about this. However, JC's British has done an incredible job over the years. Five years now they've been working on our vehicle. They've done a great job of always making me feel like they're never going to try to sell me on something I don't need. In fact there's been times where they've come and they've said, "Hey, based on our check, this thing is starting to wear. You've probably got another 3,000 miles, 4,000 miles on it, so don't sweat it. We'll fix it next time," which I always appreciate 'cause I never feel like I'm getting nickeled and dimed on every single visit. What was fascinating is I went from a sub-$100 fix to a greater than $1,000 fix, but I was actually okay because they had built the trust and rapport over time that I knew this was a legit thing that needed to be repaired, not just them trying to make an extra buck on a Wednesday morning. Dan: I really like this story, Joey, because first of all, it's happened to everybody, right? I mean, you never go in and only have an oil change. It's always the wipers or the fluids or something else needs to get done, but you're absolutely right. One of the things that sticks out to me about this particular story is that there are a lot of services that we as customers use where we are not the experts, so we have to trust the people that are providing them. Classic example's going to the dentists, right? Dan: The dentist tells you you have a cavity or you need a crown, what are you going to do? Argue with him? "No actually, I know all about crowns." Joey: "No, my time in dental school, I'm sure that's not a cavity." It's like, no. Yeah, I totally agree with you. Dan: Right, so you have to trust them. Trust becomes that key factor that helps us decide which companies we want to do business with and which companies we want to continue doing business with. Besides from the fact that these guys conveniently have your initials as their name, they clearly have established that trust with you so that when they come to you with a bigger expense, first of all they don't do it every time, and that's one of the things that helps to build that trust, and when it does happen you believe it. Now, I know you weren't happy to spend $1,000, but you probably also felt that your car was in good hands and that they were going to put in good brakes and do a good job and that you were going to be on your way and be safe. Joey: Absolutely. I think there's two points you make there, Dan, which are spot on with my personal experience and I think applies to a lot of consumers, especially in this day and age. Number one, I am not a mechanic. I am not mechanically inclined. Full disclosure. In fact my younger brother, Tommy, teased me about this afterwards. He's like, "Why didn't you just replace the brakes yourself?" I'm like, "Well, let me break this down for you." Joey: Yeah. Number one, 'cause he's the kind of guy that would replace them, and that's amazing that he has that skillset. All the genes for mechanical ability went to that sibling. I was the one who was in the shallow end of the gene pool, like not mechanically inclined. But here's the thing, I also live on a mountain, okay? My house is at 8500 feet. Brakes are a crucial piece of every vehicle, but they're a really important piece of the vehicle when you live on a mountain, so I'm never going to be the guy who learns how to do my own brakes. I'm just not. And so I love being able to have people like the folks at JC's British that I can trust to do that. Additionally, I think in every business, there are customers you have that work with you because they don't want to have to think about the solution, right? Now occasionally you have a customer who's going to come in and they're really excited about it, they want to work with you and pay you to help them with the service, but they have a lot of insight and opinion on it. For example, I used to design logos, so when we were designing the logo for our podcast, for example, I had some strong opinions about what it would look like, 'cause I'm familiar with that world and I experienced it. Changing brakes? Are you kidding me? Not in a million years. Not at all something that I want to do, nor do I ever want to do. And I agree that when you build that trust up, that they are the trusted advisor, you're actually looking at them for the recommendation as well. I'm looking at my mechanics to say now's the time when you need to do this, or, nah, it can wait another six months or a year, or occasionally they've even said, "Joey, this is a cosmetic thing. It does nothing to the overall experience of driving the vehicle, but if you care about it because of how the vehicle looks, then we might want to change it." I think it's important to gauge where your customers are and what's important to them. Dan: For sure, and building on that, some customers that come into to JCs probably are car geeks, right? Dan: And they are potentially capable of, if not repairing the brakes by themselves, at least having a more technical conversation about brakes than you and I could have, and it is important that you're there for those customers as well. Frankly, if you are as honest as it sounds like JCs is, and that is always your policy of being honest, then even the folks that come in the door and know what you're talking about and know if you're BS-ing them will know that you're being honest, right? Joey: We were not able to do a segment, folks, without Dan making a “Joey doesn't do social media well” joke. That's okay. But Dan wrote a book on this, so of course we should listen to him. He's professional. Dan: In any event, thank you very much for the compliment. I forgot what b) was, but it was really, really important, and, in any event, I think what they did was great and any time you can have a customer come in for a 30 or $40 event and have them pay $1,000 and have a smile on their face, you have clearly done your job. Joey: Totally. I think the key takeaway at least for me from this story is that trust from your customers is established by telling them the whole story, not just the part that is going to serve you financially, and when your customers do trust you and you build that track record, when you come along that there's a larger ticket sale that needs to be made or a larger ticket expense that needs to be incurred as part of their doing business with you, it's not going to be a problem. Announcer: There are so many great customer experience articles to read, but who has the time? We summarize them and offer clear takeaways you can implement starting tomorrow. Enjoy this segment of CX Press, where we read the articles so you don't need to. Dan: This week's article comes from my man, Andrew Hutchinson, at social media today. If you do not follow Andrew on Twitter, you should. He's @adhutchinson. On social media today, almost every day, he's got at least one article. He is the source to be up to date on all social channels and news. I particularly liked an article that he posted recently about Google. It's titled: Google Releases New Report on the most Popular How-To Searches. He talks about how how-to posts are kind of like content gold for marketers because they provide, as our friend Jay Baer would say, “Youtility,” and they teach people the answers to the questions that they're looking for. This new data from Google said that how-to searches have increased by more than 140% since 2004. What Google did is they created a new interactive website that shows the top 100 most searched for how-to queries. It was pretty interesting to see first of all what the top 10 how-to searches globally are, and we'll talk about that in one second. And then it was also interesting to see what these trends tended to differ a lot regionally across the world, which is not particularly surprising. Joey, can you guess what the top ... pick any in the top 10, can you guess a how-to question that would be in the top 10 in searches globally? Joey: I think there are probably some obvious ones like how do I lose weight? How do I make money? Those type of things. Dan: Absolutely, those are two. I agree with you that those are fairly obvious. How to lose belly fat is also related. There was also how to get pregnant, how to draw, how to make pancakes, how to write a cover letter, how to make French toast, so breakfast is clearly a theme. And the number one was, how to tie a tie, which really surprised me. Joey: Wow, that was number one? Dan: Yes, because how to kiss was number two, so very, very fascinating list. I think what I was learning from this is that in every business there are how-to questions. We've talked with our friend, Marcus Sheridan, and heard about his book, They Ask You Answer. He would clearly agree that you want to be the company that is answering those how-to questions about your business. Joey: Absolutely, and I think Marcus talks about this. It's hinted to in this great article as well that your customers are asking how-to questions. When they run that search, not only from an SEO point of view and potentially even from an advertising point of view, do you want to be one of the results that comes up? But I think there's an opportunity to take this one step further and really focus on the educational aspects. Imagine if you had some type of a business where you knew there were 10 regularly asked questions, and you decided to film short videos answering those questions and really getting into it, not just giving them the cursory answer and then saying, "Buy our product and you'll be able to do it even more," or something like that, but actually give them a thoughtful considerate well-rounded answer. A lot of people forget the tight correlation between Google and YouTube. If you've been doing searches recently, you'll notice that YouTube videos are popping up higher in the search results. I could very easily see a men's clothing company doing a video, or even a series of videos, about how to tie a tie and having those show up as a result as the top results on Google. If somebody has taught you how to tie the tie, well, guess what? When it comes time to buy the tie, chances are better than not you're going to go back to them. But I think it's important to understand that the customer experience starts right then. That's why Google coined that term the "zero moment of truth" because that is when the clock starts. Even though they haven't hit your website yet, they may not have even learned that you exist, but their experience has already started and that's why it's so important. Joey: Totally agree. One of the things I loved about this article is they talk about how, and you mentioned this earlier, Dan, different searches show up in different regions. There was a quote from Google that said, "North Americans and East Asians need their toilets. People in former Soviet countries are fearless enough to attempt fixing their own washing machines. Warmer climates can't live without a fridge, which makes sense. And Northern and Eastern Europeans need help fixing their light bulbs." I found it fascinating that we see these cultural desires showing up on a regional basis as indicated by their how-to searches. Just kind of a fantastic little insight into humanity. Announcer: Listen in while we try to stump and surprise each other with a fantastic statistic from the worlds of customer experience and customer service. It's time to check out this number. Joey: Okay, Dan. The number this week is 83%. What do you think it refers to? Dan: That's easy. It's a How I Met Your Mother reference, 'cause Ted always points out that Barney uses 83% when he's making up statistics, which I'm guessing you're not doing here. Joey: No no, this is actually a real statistic, and my name is not Barney. It comes from our friends at Oracle CX Cloud, the fantastic sponsors of our Experience This! show. They put together this eBook called Digital Transformation: 3 Areas of Customer Experience to Invest in Right Now, and the 83% of customers is referring to customers that are shopping online that require some type of support or service to complete their purchase. Dan: ... at most retailers, because it is really clear that people want to self-serve here, right? When we go online to shop, we want to just shop and checkout and get our stuff in the mail in a couple of days, and so the fact that that many people need some type of support or service says to me that they're unable to do that on their own, and that must be incredibly frustrating. Joey: I've never needed to ask them for help. Dan: Yeah, that's one of the things that makes the experience so great. But if I were shopping in a retailer and needed to stop the purchase in order to go ask for help, man, that would frustrate me. Joey: You know how annoying it is to go into the store and try to find someone to help you? It's even more annoying to have to do that online. Folks, don't do this, okay? For more fantastic statistics like this, go to oracle.com/connectedcx where you'll be able to download this eBook immediately, as well as if you give them an email you can pick up two more CX reports. Oracle CX Cloud, thank you so much for being behind the Experience This! show. We appreciate your support and look forward to more of it. Dan: We know there are tons of podcasts to listen to, magazines and books to read, reality TV to watch. We don't take for granted that you've decided to spend some quality time listening to the two of us. Joey: We hope you enjoyed our discussions, and if you do, we'd love to hear about it. Come on over to experiencethisshow.com and let us know what segments you enjoyed, what new segments you'd like to hear. This show is all about experience and we want you to be part of the Experience This! show.